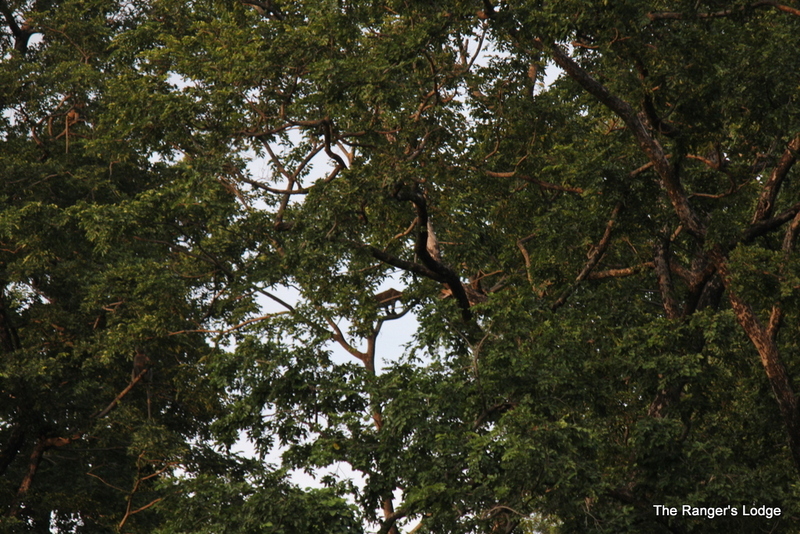 I was about to leave for my daughter’s tuition at 1730hrs yesterday and suddenly the alarm call of a Sambhar, which was confirmed by few langur calls, brought my attention to a Jhingan tree and right on top there was a leopard sitting merrily. 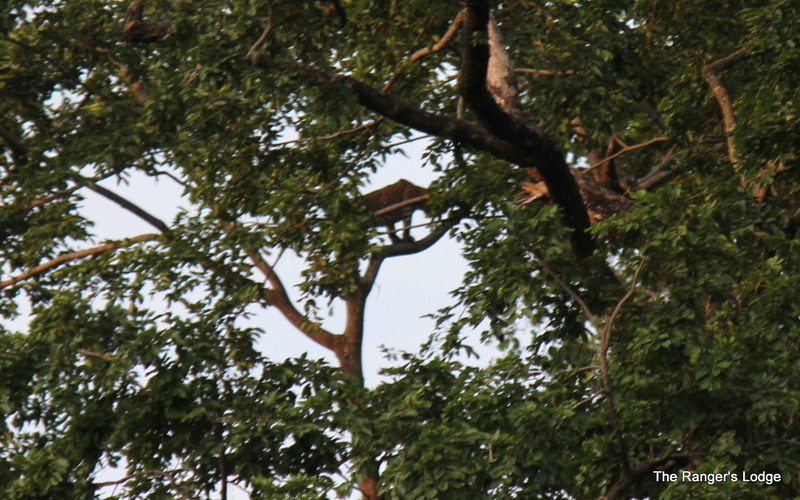 The leopard was possibly trying for a langur. 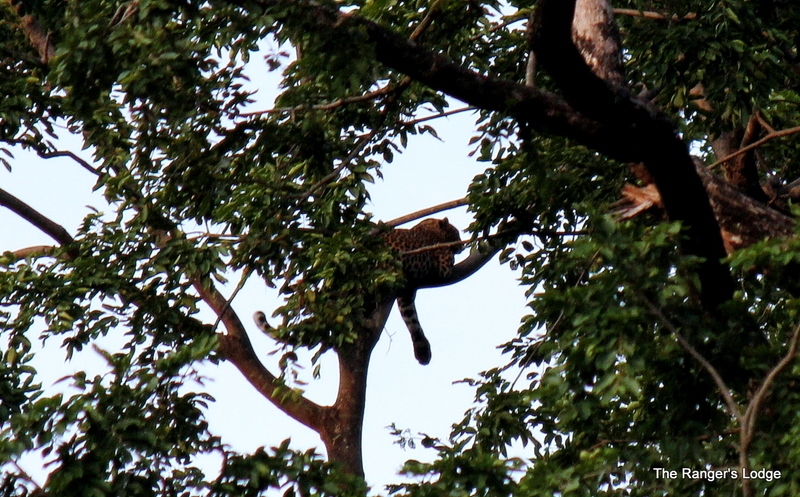 I have had quite a few leopard sightings and mostly on the trees itself but this was special, as the leopard jumped about 7 meters from a branch to another tree in the vicinity. I parked my bike and then asked my daughter to get the Camera and Binoculars. It was a great sighting. 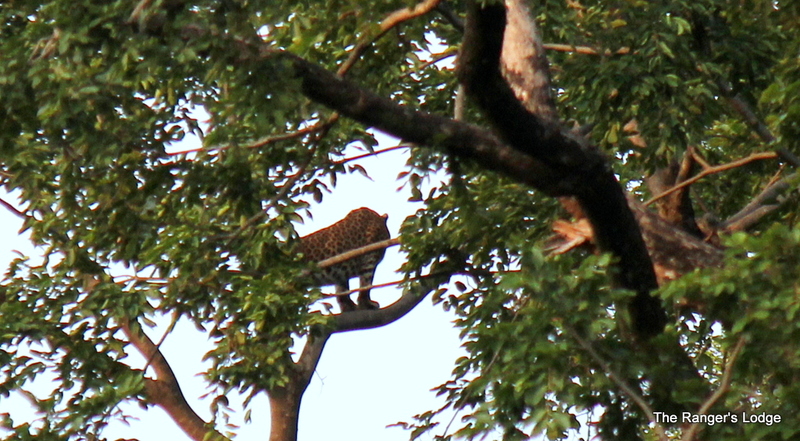 The leopard was first sighted by a boy of 13 years, my neighbour’s son. 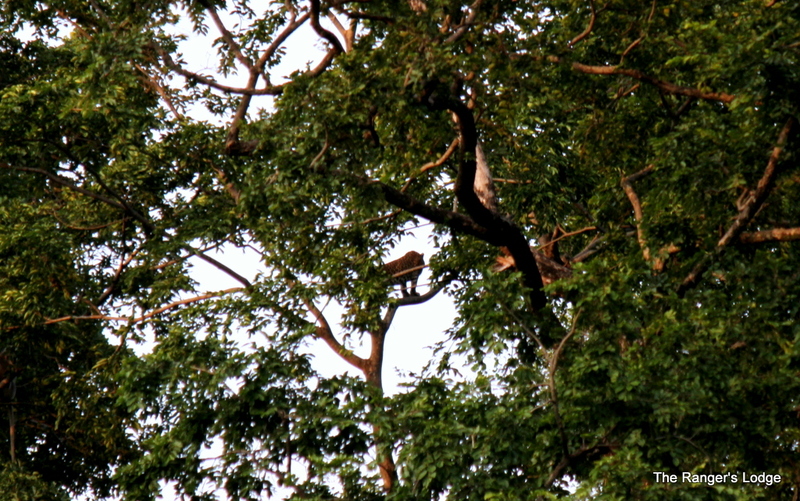 I fixed 55-250mm (the only tele with me besides 18-55 wide angle one) lens in my Canon 60D and clicked these pictures. I wish I had 400mm here. 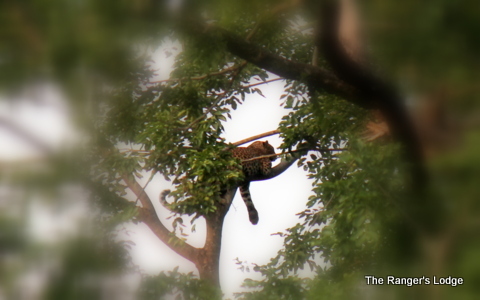 The leopard must have been about 40 to 50 meters from the The Ranger’s Lodge. 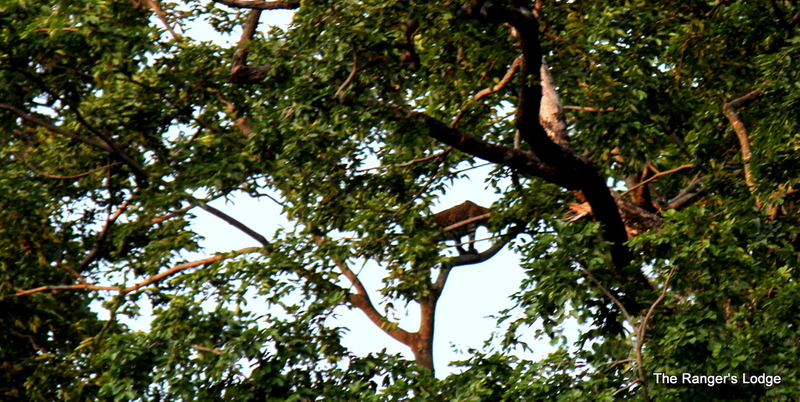 I had seen a pair of leopards about 12 days back right in front of the lodge. 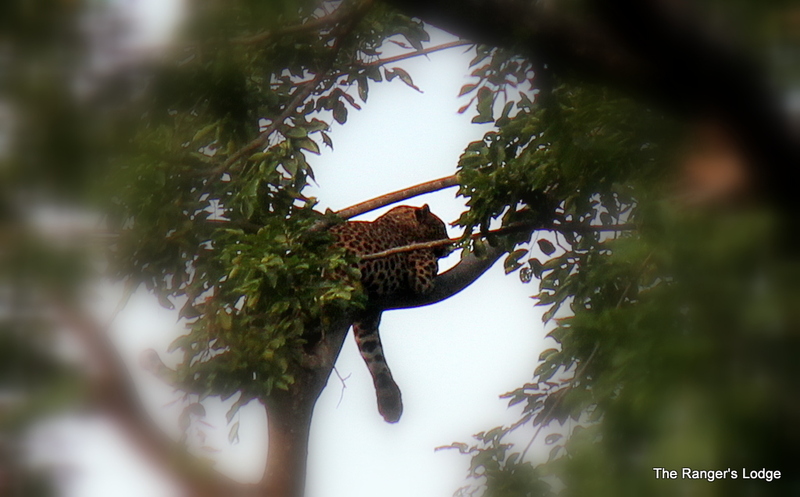 There have been 03 sightings of leopards around the lodge in the last 02 months. I couldn’t click the earlier ones since those were all sighted in the late evenings. The number of leopards in the periphery of Corbett has possibly increased, as confirmed by regular sightings on the southern periphery right from Gaujani to Sanwaldeh villages. In fact a leopard had charged quite a few people in Semal Khalia &, Sanwaldeh villages not long ago. Let me also confess that the leopard is still there in the vicinity of the lodge, as there are regular alarm calls from the Langurs. 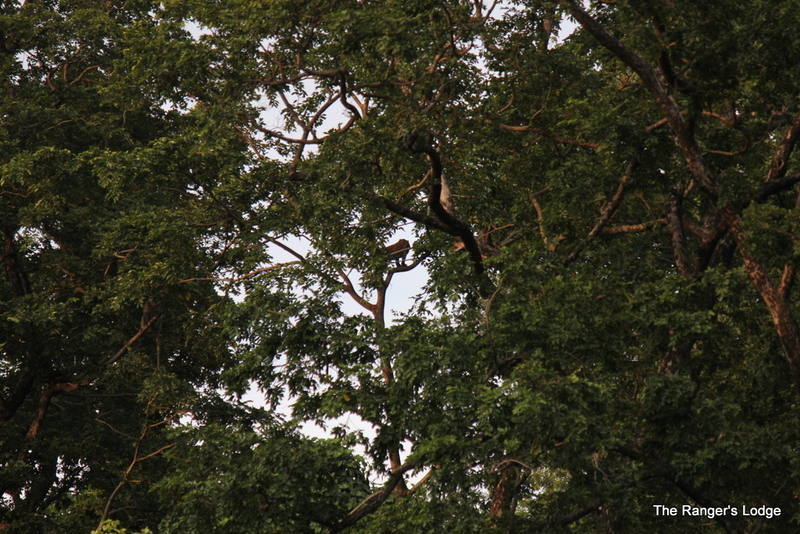 Interestingly, a loner with just the left tusk has also been doing regular rounds around the lodge. I have planted a mixed fruit orchard besides maize and then there are fledgling paddy fields next door and possibly these are the attractions for him. On 18th august evening I had few family friends over dinner and on their return back the same tusker had confronted them. Finally, other villagers and few Gandhi shots rescued them. I have also bought a Gandhi gun today. We do hope you will inform that leopard to come back soon, especially when we come in September. Awesome sighting Imran!!! Well narrated as well! All the very Best!! May your home always be full and May you always have Great sightings!!! God Bless!! Thank you Geetaji for the nice feedback! Are you still promoting Corbett for your wildlife enthusiasts? If yes, please check out my place for your future guests intending to do intensive wildlife itineraries, birding, Cultural exposure to Gujjar villages, etc. It will be great help to a fledgling venture. Thank you, Mr. Khan for this wonderful update. It was a pleasure reading through it. Hope to visit your place someday very soon!